Optional Accessories— up to 20% off! The Hoyer® Calibre is a uniquely designed electronically operated patient lift for the safe lifting of heavier patients. It is both sturdy and robust with a safe working load rating of 850 lbs. The Calibre has been designed to be configured with or without a weigh scale. The weigh scale is seamlessly integrated with a digital display on both sides and user-friendly controls. The large, open cradle results in less discomfort to the patient caused by pinching and squeezing. 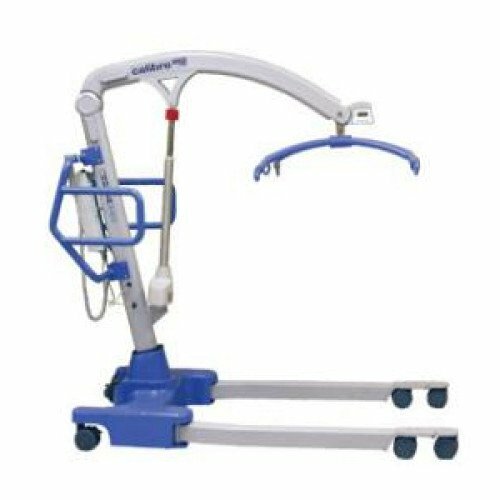 The powered base allows the legs to be opened and closed to enable access around arechairs, wheelchairs and simliar obstacles without bending or twisting. Some assembly required. Most Patient Lifts come packaged in three main components. We usually ship in 1-2 business days; some products are able to “Express Ship” same day, if the order is placed by 1 PM EST. Average delivery time is 3-5 business days in the Continental USA. Reach at Maximum Height 28"
Reach at Minimum Height 26"
Legs Open - External Width 55.25"
Legs Open - Internal Width 49"
Legs Closed - External Width 33.25"
Legs Closed - Internal Width 26.75"
Overall Height of Legs 4.75"
Mast, Base, Boom Assembly, Cradle 240 lbs. All measurements are within a +5/-5% tolerance. For warranty claims with your Patient Lift, call our expert customer service representatives, and we will arrange to have the replacement parts sent. Amica Medical is an Authorized Dealer and Service Center for all products in our store. If you need on-site service, please call to arrange a visit from our network of Manufacturer’s Approved Service Centers. Service calls are not covered by Manufacturer’s Warranty, and have a minimum charge of $85.00. All Durable Medical Equipment has a Limited Manufacturer’s Warranty. The following parts will be repaired or replaced at our discretion, during the warranty period. Exclusions: Parts consumed due to normal wear and tear. Note: Any product abuse or intentional misuse voids the warranty. Product must be in new condition. For example, no cracks, scratches, dirty or marked tires, or any indications of usage. Product must be returned in its original packaging. A Return Merchandise Authorization must be requested from Patient Lift USA within 14 days of delivery of the product. Once an RMA has been received, products must be returned within 14 days. All returned products require a Return Merchandise Authorization number. Returns received without this number will not be credited. The easiest way to request an RMA number is by calling us at 888.826.4423, option 3. PLEASE NOTE: Products returned without an RMA number will not be credited. To receive full credit, items must be shipped within 14 days from the day the RMA Number and shipping information were provided by Amica Medical Group of Companies. Unless Amica Medical made an error, return freight is the customer responsibility. We will be happy to help you determine which shipping method to use once you have requested your RMA number. We highly recommend insuring larger items for their retail value to protect against shipping damage. Please be sure to carefully follow all return-shipping instructions that are included with your Return Merchandise Authorization number. If an item is returned to the wrong address, Amica Medical reserves the right to charge for any additional shipping fees associated with shipping the item to the correct location. In addition, if a scheduled pickup with a delivery carrier is missed, Amica Medical may institute an additional fee per missed scheduled pickup. Orders cancelled after the item has shipped are subject to all standard return policies. You must accept delivery, obtain an RMA Number and ship the item back to the correct address. If delivery of an item is refused, return shipping costs are deducted from the issued credit and a 25% restocking fee (minimum $25) will apply. Second-Day and Next-Day shipping costs will not be credited if delivery is refused. Heavy products shipped via Freight, may incur additional shipping charges, which are not refundable. Once your return is received, Amica Medical will issue a credit to the credit card used for the purchase. Please allow up to 4 weeks for your credit to be issued. If your item is defective or was damaged in shipping, please call us at 888.826.4423 or email us at customer.service@amicamedicalsupply.com. We will arrange for the item to be repaired or replaced promptly.